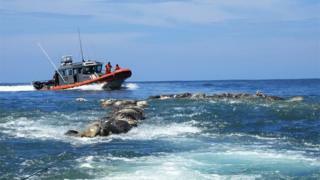 Fishermen in the southern Mexican state of Oaxaca have found about 300 dead sea turtles entangled in fishing nets. The find comes just days after another 102 olive ridley turtles were found dead in neighbouring Chiapas state. Olive ridley turtles, which lay their eggs on the beaches of a number of Mexican states between May and September, are considered to be facing a high risk of extinction in the wild. The cause of their death is still under investigation. It is not clear whether they got caught in the nets while still alive or were already dead when they became entangled. Experts say they could have been killed by harmful algae, fish hooks or could have suffocated while trapped in the nets. Mexico banned the capture of sea turtles in 1990 and there are stiff penalties for anyone killing them. A specialised federal attorney is investigating the case.